A few years back I started with beekeeping. Not knowing the journey it was launching me into. Before I started, bees were just little insects which made honey. You have a queen, a few bees and a beekeeper who has one or multiple hives. That is all I knew. It all started with a intro lesson at the local beekeeping club. It was with about 10 people of all ages. We got suit up and we joked a little about how we looked. When you think about beekeepers you normally see old men with smoking pipes (now a days also a lot of hipsters with beards on the internet), And this thought is also 90 percent true. Beekeeping is a old men’s (or women’s) hobby. But in recent years it gets more attention. So more people are joining. The master beekeeper was giving a small talk about what we could expect and we would probably seeing. After the talk he took the smoker, blew a little smoke into the hive entrance and broke the hive boxes apart. At first sight it was amazing to see so many bees at once. Still doing their task in the hive. Not bothered by the beekeeper which was taking out the frames one by one. After we finished the lesson and the suit was off, everybody headed home. The bees had fascinated me intensely. The Bee-fever got me. As every new beekeeper will experience when they got the bee-fever waiting takes too long. 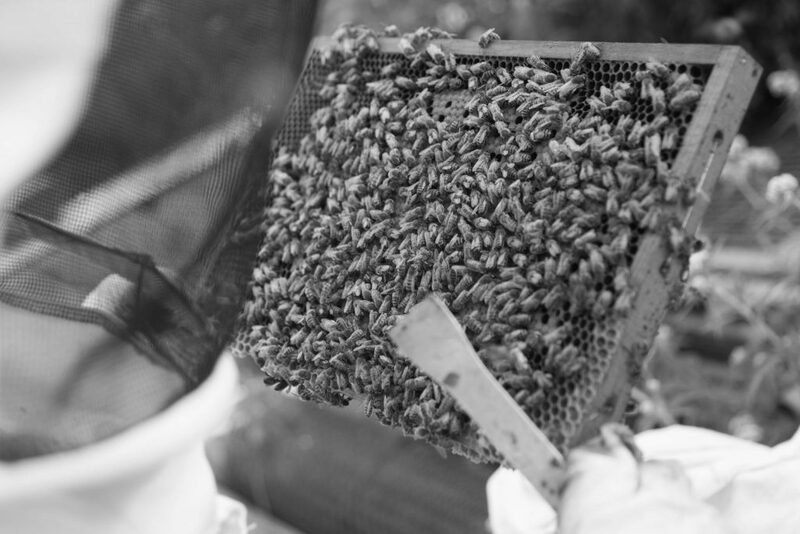 The introduction lesson was at the beginning of June and it was too late to start with beekeeping. Normally the bees fly until mid august in the netherlands. So the only thing to do, was waiting until next year when a new course started. The course was planned to start around march. So I still had around 9 months of anticipated waiting to go. Good luck that it was winter so there was time to devour every book on beekeeping I could find. Also watched every video on youtube that was interesting, and there are a lot of videos. The netherlands, to be more specific the province of South-Holland is densely populated. Especially where I live it is difficult to find a suitable place to locate the hives. Before the beekeeping course I contacted the county to ask permission to place the hives on my rooftop. Unfortunately this was not feasible by local regulations. For new beekeepers who live in the city or a large town, be aware when you ask permission to your county. If your county or city government does not like the idea, the chance of succeeding if you don’t have a already good spot is very limited. The surprising part was that the county was very enthusiastic about beekeeping. Only the part of placing the hives on the roof in a residential area was not so great. During further contact with the county, they offered me several places on secluded areas. what really surprised me. Some areas were really great. The only issue that was limiting was I had to move the hives in the winter, which was not possible because there was not a place to put them other than the roof which was rejected. So we had a place for 6 months of the year, for the other 6 months it was still a question. Sometimes the answers are quite obvious only you didn’t thought about them. When discussing the matter at home my mother raised a possible location. A friend from my parents, whom stopped with growing flowers as a business had a little vacant plot we could probably use. We only had to ask. When contacting him it was not really a question if it was possible. It was more a question when the bees would arrive. So we had a location, but now we needed bees. After long waiting, march was there and we started the course. First we got a few lectures on bees etc. Which for the most part I already absorbed from the internet. End of april it was planned to start the practical lessons. In pairs of two we all got to adopt a hive for that year. The tip was given to buy hives at the same time of the course. So it is easier to implement the knowledge on your own hives. Little did I know that every hive is different, for me each hive has it’s own character. Some are more aggressive than others. We did a online search and we found a beekeeper who needed to stop ASAP with the hobby because of allergies, he had 2 hives available. My father and I drove about 1.5 hour to get the hives. Just loaded them in the car and drove home. The sale was quickly done. and we headed home. When you transport bees in a normal car take care the bees are properly locked up. But there must be sufficient cooling. Finally we reached the end destination. we loaded the bees out of the car. After the two hives were installed on the ground we let the bees out. We let the bees out of the hive by opening the entrance. What happened then was an amazing experience. The bees started to come out of the hive and circled around the hives. there were a few hundred of them, this all took a couple of minutes after which the flew away. Into their new home. Described above was the start of my beekeeping career. I still have a lot to learn. When you start your own journey you should take into account that every experience is different and everybody makes mistakes when starting. They always say that it takes a couple of years to get a little good at beekeeping. Don’t take it too hard on yourself if the first few hives are abortive. During my first year of beekeeping I took notes and did research which helped me with beekeeping. I will re-write the notes to a set of articles which are hopefully helpful to you. Bees are wonderful insects and if you allow them can be a wonderful guide to a whole new world. Beekeeping taught me to be more relaxed, bees notice when you are stressed and don’t allow it when you handle them rough.